On the following pages, the step-by-step process of undergoing LASIK and PRK laser vision correction surgery, from your initial consultation to your post-operative instructions, is explained in detail for both procedures. In LASIK surgery, a corneal flap, which is between 140 and 180 microns (thinner than a human hair), is created using a femtosecond laser. The flap is then carefully lifted so that Dr. Mandel can re-sculpt the corneal tissue beneath the flap to correct nearsightedness, farsightedness and astigmatism. At Manhattan’s Mandel Vision Laser Vision Correction Center, Dr. Mandel exclusively performs the blade-free, all-laser method of LASIK utilizing the IntraLase Femtosecond Laser. The IntraLase Laser, used to create the flap, in combination with the VISX Star S4 Excimer Laser System to re-profile the cornea, is the only method of LASIK approved by NASA for its astronauts and for our Armed Forces. Click here to learn about the LASIK laser vision correction process at Mandel Vision’s state-of-the-art Manhattan laser vision correction center. For those patients who are not candidates for LASIK surgery or who prefer PRK to LASIK, a corneal flap is not created. 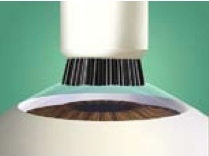 Instead, the corneal epithelium is gently removed using a specialized epithelial brush. The cornea beneath the epithelial layer is then sculpted with the same VISX Star S4 Excimer Laser System utilized in LASIK surgery. 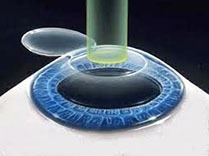 A bandage contact lens is then placed on the eye to allow the corneal epithelium to regenerate. Click here to learn about the PRK laser vision correction process at Mandel Vision’s state-of-the-art Manhattan laser vision correction center. 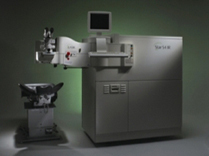 The laser that sculpts the cornea, in both LASIK and PRK, typically takes less than one minute. Both PRK and LASIK take between 3 to 5 minutes per eye and both procedures are painless. The specific post-operative regimen as well as what to expect after each procedure is covered in the next few pages. You’ll need to return to our laser center for a second evaluation after discontinuing your contact lenses for a longer period of time and/or lubricating your eyes in order to determine candidacy. You are not a candidate for laser vision correction. *All patients who are candidates for LASIK are also candidates for PRK. However, those patients who are only candidates for PRK are not candidates for LASIK. That said, if you are a candidate for both laser vision correction procedures, Dr. Mandel will counsel you on the differences between LASIK and PRK in terms of the procedure itself, the recovery period, your post-operative regimen as well as the timing of visual recovery. After you are fully informed about both procedures, Dr. Mandel will get to know you personally, including your profession, hobbies and lifestyle. Then, you will decide together which procedure is best for you. As an experienced corneal and refractive surgeon, specializing in LASIK and PRK in our state-of-the-art Manhattan laser vision correction center, Dr. Eric Mandel knows this experience is most successful when patients are well-informed about both procedures before they proceed with treatment.